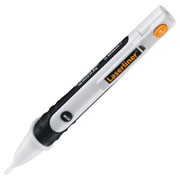 LaserLiner 083010A Contactless Voltage Tester. Handy contactless voltage tester with zoom function and super-bight flashlight. Contactless detection of live lines from 24V AC to 1000V AC. Locates electrical voltages in cables, sockets, bulb sockets and fuses. Finds breaks in wires and cables. CAT III – 1000V can be used for measurements throughout building installations. Extremely high sensitivity for tracing lines at great depths (Zoom). Clearly visible LED for signalling electrical voltages. Super-bright, integrated flashlight with separate ON/OFF button. Compact design with convenient clip, practical for shirt pockets and tool boxes.